I just cronographed my new 20 Practical. It is a 1-10 twist Shilen barrel on a savage Model 12 single shot action. 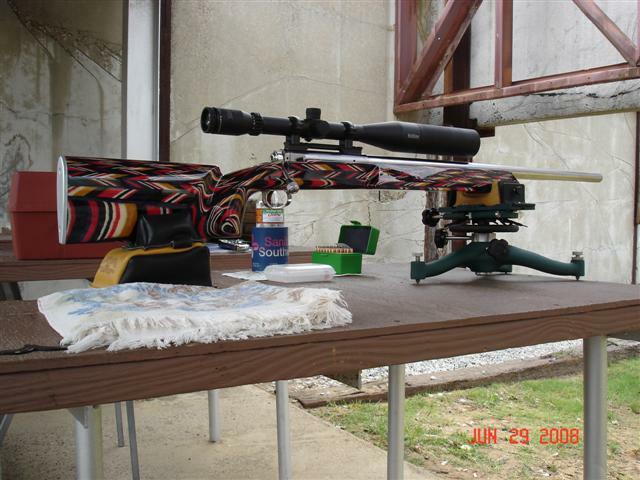 I am getting 3950fps with 39gr Blitzking over 24.5gr of RL-10X lit by a CCI 450 primer all in Lapua brass. This combination is very accurate and it is going to be alot of fun this summer shooting gophers. Hello, I'am shooting 39gr BKs with 25gr 10X out of my 20 tactical with an avg vel of 4074.I worked up slowly to 25.5gr of 10X & was at 4250 avg vel with scary accuracy.This has to be my favor it rifle.Cheep to shoot with a very high fun factor.I think you will really enjoy your practical. My OAL is 2.310" and my barrel length is 24". I had no idea that velocities were this high... Im going to love the 20 practical i think. I will try the H4895 for sure, its easy to get it here. I'm just getting started with mine but so far I'm likin' it. Initial tests show ~3,500fps with 35g Bergers in my 18" AR. I've also started working on 50g Bergers (Shilen 9 twist) but I don't have any chrono data yet. Seriously thinking about building a bolt gun now too! btw, thanks for sharing the info on the Viht powder in the short barrel. I'm gonna have to try that in my AR....using H4198 with the 35 Berger right now.